As you may have noticed, today is not Friday. Ok, by the time this post goes up it may well be Friday, but by then I will be an entire week late in posting this soup (and, if we are being honest, actually making it). My December went by in a blur of holiday stress and excitement, and I (once again) let my blog go to seed. I only made two out of the three December dishes for French Fridays with Dorie, and I only posted about one of them (I would still like to talk about the beef daube, though, because it was so darn good). 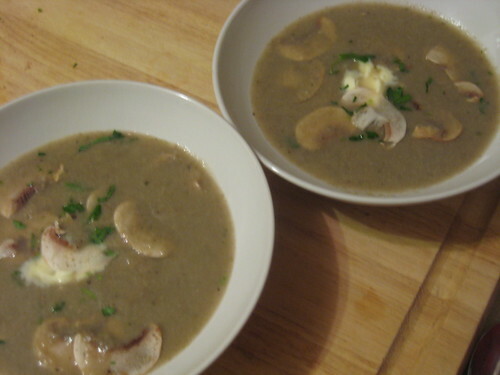 Since I want to get back in the cooking (and blogging) routine, I thought that I would take one of my days off to make the recipe that I missed last week, Paris Mushroom Soup. Now, if you are a member of my family or even a casual reader of my blog, you might think that the base of this soup, a mountain of white button mushrooms, would make me happy to skip it. 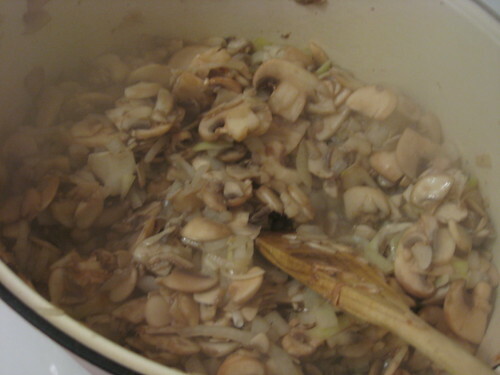 It is true that I have mentioned on multiple occasions that I am not exactly a lover of fungus, but lately I have been cooking with them more often and finding recipes that I really like. Button mushrooms tend to be my least favorite (except when they are stuffed with copious amounts of cheese and sausage), so I hoped that this recipe might give me another reason to have them around. Well, while I can't say that I will start buying mushrooms in bulk, this soup was not bad. I know that that is not exactly a glowing recommendation, but it is fairly high praise from a person whose phobias include heights and mushroom soup. On the positive side, this soup was very easy to make and it actually came together quite quickly. Slicing three cartons of mushrooms took a bit of time, but while I don't exactly adore eating them, mushrooms are one of my favorite things to chop. I love how my knife glides so smoothly through each cap, so this never feels like a chore. The actual soup was good, especially with a generous dose of kosher salt, but I did find the rosemary a bit too assertive for my taste. 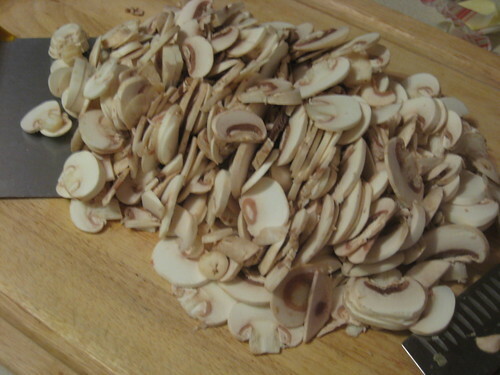 I thinly sliced a few mushroom caps for the mushroom salad, but I would have preferred the soup without them. 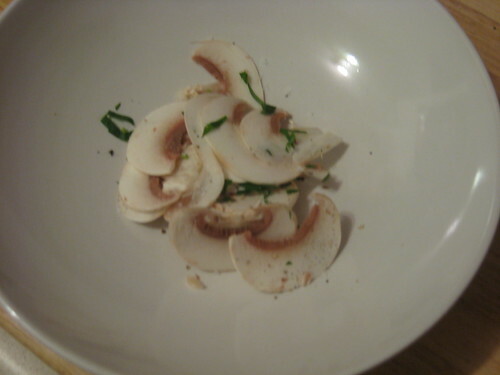 Raw mushrooms have textural issues for me, and a brief soak in a ladleful of hot soup did not adequately soften them. A dollop of creme fraiche, as always, was a welcome addition, especially because I found the flavor of the soup a bit too simplistic. While I probably won't be making this soup again, I don't regret trying something new. I am happy to be posting again, and hopefully you will be seeing another post (one that is actually on time!) tomorrow evening. This cold weather is perfect for steaming bowls of soup and (spoiler alert) rich and cozy pasta dishes, so I am especially happy to be back preparing these dishes from Around my French Table. Please head over to the FFwD site to see how everyone fared with their first French Friday in 2011!